President Trump claimed some personal victories in the 2018 midterm results, and as he ticked them off at a press conference on Wednesday he might as well have been walking through the Electoral College map for 2020. "When you look at the races that we won in Florida, which we weren't expected to win, and Georgia, which we weren't expected to win, and Ohio, which we weren't expected to win, and won -- I mean, you look at some of them, the number of votes that we got is incredible," Trump said. "So I'm really happy with -- not only the way it came out, but the response to me as your president." The outcome of some of those races are still up in the air. As the president and his political advisers map out a strategy to win re-election in 2020, Ohio and Florida especially are must-win states. But they may be feeling less confident in some other key states where Democrats clawed back this week. It's the most critical swing state in the country. Both Republicans and Democrats know the importance of winning the state — no GOP nominee has won the presidency without also winning Florida in almost a century. "There is no Republican winning coalition that doesn't include Florida — you can't make the math work," said GOP strategist Brad Todd. "The fact that Republicans won both races there when Democrats were amply funded and felt like they had a ticket that matched their electorate is a pretty big deal." Both Florida contests could be headed for a recount, however, a reminder of the 2000 presidential race that underlines how key the state remains as a battleground. Florida Democratic strategist Steve Schale argued that even if Democrats ultimately aren't victorious in their two statewide contests, the fundamentals of the state haven't changed — it's still a very evenly divided state that is still up for grabs in two years, though Democrats still have work to do. "Where [GOP gubernatorial candidate Rep. Ron] DeSantis and [GOP Senate candidate Gov. Rick] Scott did well were places that Obama did pretty respectably in 2008 and 2012," said Schale, who helped lead the former president's successful efforts in Florida. He acknowledged that both DeSantis and Scott did well at reaching out to Hispanic voters — a possible struggle for Trump in two years if he keeps doubling down on fear of immigrants and revoking birthright citizenship. An analysis in Politico's "Florida Playbook" found that DeSantis did 16 points better with Cuban voters than Trump did in 2016. Florida is ever changing, with a growing Latino population -- which doesn't always vote Democratic either — and an ever-increasing influx of white retirees that lean more conservative, something Trump can exploit to his advantage. "I'm calling this right now: Unless Trump is getting taken down easily in his re-election, he is winning Florida in 2020. It's not a tossup. It's Lean-R," said Matt Isbell, a Florida Democratic data analyst told Politico. "The Florida election map is changing under Trump. It's the data." The state striking the most fear in Republicans after Tuesday's election may be Pennsylvania. Trump won its 20 electoral votes by about 44,000 votes as he toppled Hillary Clinton's "blue wall." Democratic incumbents easily won re-election for governor and Senate, and Democrats -- aided by a court-ordered redistricting map -- also flipped several House seats. Pennsylvania GOP strategist Mark Harris admitted "it was a bad night for Republicans across the table." "We have to be able to reach out and win educated suburban voters," said Harris. He pointed to Republican Gov.-elect Mike DeWine in neighboring Ohio as someone who was able to do that, while Pennsylvania GOP Senate nominee Lou Barletta and Republican gubernatorial nominee Scott Wagner could not. Trump managed his victory in Pennsylvania by driving up turnout in rural areas — but it's unclear whether that will be enough in 2020 with the suburbs apparently energized. If Trump were to lose the trio of Pennsylvania, Michigan and Wisconsin in 2020, he wouldn't reach 270 electoral votes again, even if he kept all the other states. Todd, the GOP strategist who co-wrote "The Great Revolt: Inside the Populist Coalition Reshaping American Politics," said he is concerned about Pennsylvania's prospects in 2020. But even with statewide losses in Michigan and Wisconsin on Tuesday, he argued there were still encouraging signs for the GOP and Trump in the Midwest. In Iowa, Republican Gov. Kim Reynolds was elected to a full term, while the Wisconsin GOP held onto the state legislature even as Gov. Scott Walker narrowly lost. Todd called Ohio "kind of an undersung Republican story." DeWine not only won there, but Todd also points out that GOP Rep. Jim Renacci over-performed expectations by getting 47 percent in the Senate race against Democratic incumbent (and winner) Sherrod Brown, despite being vastly outspent and being seen as a problematic candidate. 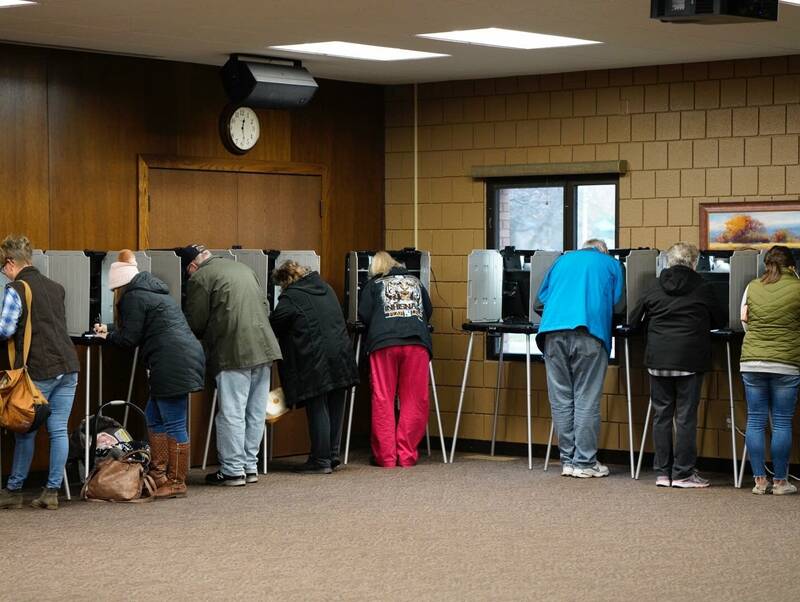 However, Michigan Democrat Gretchen Whitmer rolled to victory in the governor's race, and incumbent Sen. Debbie Stabenow was also re-elected as Democrats flipped two House seats in the suburbs and exurbs. Michigan was Trump's narrowest victory in 2016, with a margin of just over 10,000 votes overall -- and now signaling plenty of worry for 2020. Story of the suburbs ... and beyond? Republican pollster Whit Ayres, who wrote the book "2016 and Beyond: How Republicans Can Elect a President in a New America," said that what the 2018 midterms reinforced was the divide still evident from the last presidential results. Democrats did well on a national level with the House, much like how Hillary Clinton won the popular vote but ultimately lost the presidency, while Republicans still won in states that are important to the Electoral College. "It's very easy to over-interpret the impact of a midterm on the next presidential race, as both 2010 and 2014 taught us," Ayres pointed out, noting that while Obama had disastrous midterm elections he still won re-election. "That said, 2018 reinforced the patterns we saw in 2016, with Republicans doing better in smaller, slower growing, more rural counties and Democrats drawing more strength in larger, more faster growing suburban counties." The suburbs are how Democrats were able to take back the House, but they ultimately still fell short in targeted House seats in North Carolina — another state Trump was able to win after it had gone for Obama in 2008 — and Ohio, which Trump won solidly after Obama carried it twice. Both Texas and Georgia could be interesting to watch in the coming presidential cycles. Clinton came within 10 points of Trump in Texas and trailed him by less than 5 points in Georgia. The governor's race in Georgia is too close to call, and other statewide races were also tight. Democrats flipped a district in the Atlanta suburbs that has been represented by Republicans for 40 years, for half of that time by former House Speaker Newt Gingrich. Texas Democratic Senate nominee Beto O'Rourke came closer than expected in his challenge to GOP Sen. Ted Cruz, smashing fundraising records in the process. Democrats also flipped two Texas House seats and came very close in several others. Texas could finally, after years of Democratic boasting, be competitive. But based on those specific statewide races, the lesson might be that it takes skilled candidates like O'Rourke and Georgia's Stacey Abrams to generate the needed enthusiasm to upend the map in traditionally red states, much like Obama was able to do in 2008 when he won previously untouchable states like Virginia and Indiana.